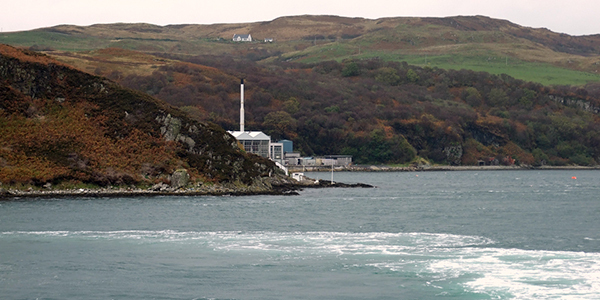 Caol Ila is one of two Islay distilleries owned by the Evil Empire of Scotch, Diageo (Lagavulin is the other). It somehow maintains the kind of goodwill usually reserved for small, plucky craft distillers, despite operating at an industrial level and literally pumping out millions of liters of spirit–mostly for Diageo’s blends. Almost all (if not all) of Caol Ila’s spirit is tankered off Islay and matured and bottled in a central location in the Highlands (this is true of almost all of Diageo’s distilleries)–so much for the romance of terroir. However, as I say, Caol Ila’s reputation is strong and this is because their whisky is very good (and it’s worth remembering that almost all whisky is essentially an industrial product). Because so much of Caol Ila is made for blends, there are lots of barrels available from independent bottlers, and much of it for far more reasonable prices than those commanded by its more heavily peated brethren on the southern end of Islay, Laphroaig, Ardbeg and Lagavulin (there is almost no Lagavulin available from independent bottlers). There are independent bottlings available in the US as well, but if you haven’t tried it you should begin with the easily available and excellent distillery bottled 12 yo. The Distiller’s Edition, to my mind, is far less necessary–all the malts in Diageo’s Distiller’s Edition series are essentially the entry-level bottling “finished” for a short extra period in a cask of a different type (in this case, moscatel), and of the ones I’ve tried only the Lagavulin D.E. is worth the fuss (not to mention, the cost). The vast majority of Caol Ila’s spirit is matured in ex-bourbon casks, as is the whisky I am reviewing tonight, from the famous London merchants and bottlers, Berry Bros. & Rudd. It was distilled in 1980 and bottled in 2011, but as specific dates are not given I am not sure if it is 30 or 31 years old. Nose: Sweet peat, kelp, oyster liquor, ozone. Some lemon, salt (preserved lemon?). A very faint hint of rubber. Expressive and austere at the same time. After a while settles down to a musky, sweet peatiness with just a hint of lemon peel around the edges. With time the rubbery note expands a little (rubber bands, not tires) and after more time yet gives way again to that musky peat, with something savoury along for the ride now. With a touch of water, something creamy emerges–lemon curd? More ash now too. Palate: Sweet at first; then a slightly astringent bite that ushers in the lemon and lemon zest. Gets quite tart with some salt crystals popping on the tongue from time to time. And there’s the minerally, (wet) stony note I associate with so much Caol Ila. A touch of aspirin too, perhaps. Water doesn’t do much for the palate–both the lemon and the sweetness get less intense. Finish: Long. Musky peat. Stays minerally and briny. A little ashier with water. Comments: Really high quality and quite quintessential Caol Ila. This is one of those older Caol Ilas that really supports the school of thought that suggests that rather than spending stupid money on the dwindling stocks of Port Ellen, we could enjoy the same profile by buying Caol Ilas at a fraction of the cost. Still, this one is missing just a little bit of complexity on the palate and finish and that keeps it out of the 90s for me. 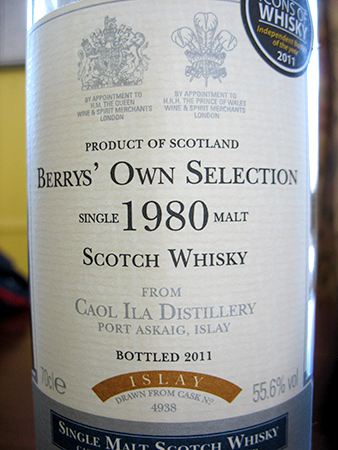 This entry was posted in -Whisky by Rating, 85-89 points, Berry Bros. & Rudd, Caol Ila, Whisky by Bottler. Bookmark the permalink. Perfect comment on the Port Ellen. If very public whisky enthusiasts — even those who are, let’s say, maniacal — can’t identify PE blind and think it’s Caol Ila, why should anyone shell out for PE? Lots of stuff is rare in the world. It doesn’t make them taste better.